There is also an introduction chapter dedicated to the transition from acute care to ambulatory care and the critical nature of hand-offs in ensuring patient safety and quality of care. Two chapters are devoted to technologies that provide decision support and information systems for all dimensions of care coordination and transition management: one focused on informatics, and one focused on telehealth nursing practice. The text is written for nurses in all settings; from ambulatory care to hospitals, extended care facilities to student nurses. The text is evidence-based and is organized to include definitions, learning outcomes and objectives, a table of knowledge, skills, and attitudes (KSAs), and nationally-recognized core competencies for quality and safety education for nurses (QSEN), inter-professional collaborative practice, and public health nursing competencies. 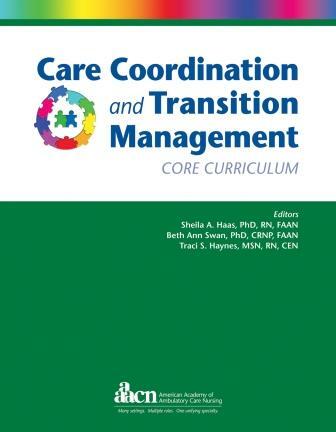 The Core is also a useful resource to help you prepare for the Certified in Care Coordination and Transition Management (CCCTM) exam provided by the Medical-Surgical Nursing Certification Board (MSNCB) in collaboration with AAACN. The Core is the background for AAACN's CCTM Course, which offers 26.4 contact hours. Learn more about the course. Members are limited to purchasing up to 5 copies of this item at the member price. For larger orders, please email aaacn@aaacn.org. Buyers of the CCTM Course are entitled to purchase the CCTM Core at 50% off. To obtain the special promo code, contact aaacn@aaacn.org. If you have purchased the CCTM Course and have the discount code, click the button above to add the CCTM Core to your cart. Then, enter the discount code and apply it to receive 50% off the member or non-member price.